With a stay at Club Calimera Imperial Resort - All inclusive in Sunny Beach, you`ll be a 1-minute drive from Sunny Beach and 7 minutes from Action Aquapark. 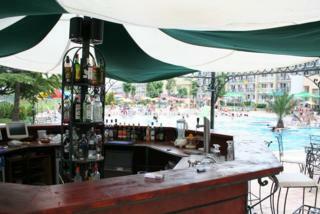 This 4-star hotel is 3.2 mi (5.1 km) from Aqua Paradise and 0.2 mi (0.3 km) from Nessebar Stadium. Make yourself at home in one of the 194 air-conditioned rooms featuring flat-screen televisions. Rooms have private balconies or patios. Complimentary wireless Internet access keeps you connected, and cable programming is available for your entertainment. Private bathrooms with showers feature complimentary toiletries and hair dryers. Relax at the full-service spa, where you can enjoy massages. You can soak up the sun at the private beach or enjoy other recreational amenities including an indoor pool and a fitness center. Additional features at this hotel include wireless Internet access (surcharge) and barbecue grills. Enjoy a meal at Casablanca or snacks in the coffee shop/café. The hotel also offers room service (during limited hours). Relax with your favorite drink at the bar/lounge or the poolside bar. Buffet breakfasts are available daily from 7:30 AM to 9:30 AM for a fee.